Speed up your Magento using cache to the full. Decrease pages loading time and improve user experience, which leads to a better conversion rate and higher search rankings. Magento 1 Full Page Cache - how does it work? Why a Magento website has to use a page cache booster? When you want to make money, you need to provide customers with ease and comfort when navigating your website. A slight delay in product page load, during search operation or while browsing your catalog may result in a lost customer. Forever. Magento by itself has a caching mechanism, but it does not cache pages. We’ve run a test to check how the FPC affects page serving time. You'll find the test results below. When you don’t have FPC extension installed, each time a visitor comes to any page of your website, Magento first reads a bunch of configuration files to check which blocks need to be displayed on the page. After that Magento takes each block and starts “generating” it and placing on the page. This all takes much time. With the Full Page Cache extension, when a visitor comes to any page of your website, the extension already has a ready page to serve. The page had been prepared and saved into cache with the very first visit, so Magento did all the rendering work only once as opposed to each time someone opens the page. Thus, it saves up to 1-3 seconds on each page request. Respect your customers’ time and they will literally pay you back. According to our research and tests, regular product view page in Magento takes around 2.2 seconds to load. Using our FPC extension, it takes 45 ms (0.045s) to load the page, which is more than 40 times faster. Therefore having the same server hardware and configuration, your website can serve much more pages from cache, saving more money. You can specify the time period for updating your cache. It will be updated as often as you choose. This will help to keep your data up to date with minimum speed loss. The feature is useful when your website gets updated not only via admin panel (e.g. when products are imported by some automatic script). 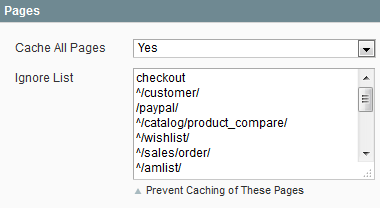 Changes done via Magento admin panel get cached immediately. You’re in control of whether to use dynamic blocks or not. The Full Page Cache extension completely supports caching of dynamic blocks, serving both page and blocks from cache. Dynamic blocks, such as shopping cart sidebar block, shopping cart floating window, logged in customer welcome message, and others are cached separately for each visitor of your website. And when some page is served from cache, dynamic blocks are being injected automatically into the “holes”. This is also known as holes punch feature. Moreover, dynamic blocks of 3-rd party extensions are also supported. Specific behavior for such blocks may be configured on advanced level within the extension configuration file. You might want to disable support of dynamic blocks completely if your custom theme does not use them, or if caching of third-party blocks works incorrectly. It's hardly possible to overestimate the role of Magento speed optimization, as speed is one of the major factors for Google to rank a website. The page load time is measured by Google and other search engines and used to put your website higher in search results when your loading speed is faster. In addition to speed increase, the extension has a setting to detect whether a search engine robot or a regular visitor is browsing your website. We applied this SEO feature to help robots index websites more quickly. If it is enabled, the module will load pages for robots even faster, as there is no need to start customer session in such cases. If you would like not to cache some pages, you can do so by listing the pages in the extension configuration section. For example, shopping cart page should not be cached, as it’s different each time and for each customer. The FPC extension automatically keeps cache up-to-date. It refreshes different types of page cache when the information gets modified. For example, when you edit product information, the extension automatically refreshes cache for category, search and product view pages.This is handy, because at some point you or a staff member may forget to flush the cache manually. By the way, manual cache refresh is still available. The module enables you not to separate cache for different customer groups, thus improving storage usage. Optimize server load by automatically redirecting store visitors to the already cached pages and decrease the average page loading time. The best solution to navigate users to the required pages is the Amasty GeoIP Redirect extension. Reset page lifetime after each customer visit. 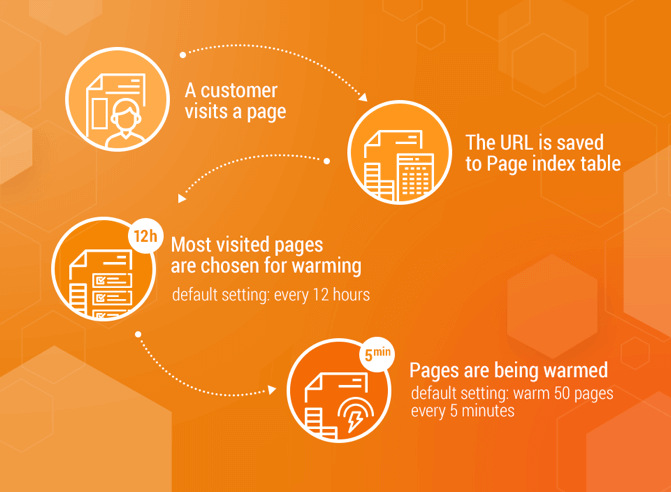 When a particular page is visited by a customer and its cache is 'warmed', the page lifetime will be automatically reset. With this option you can easily optimize the cache process and keep all site pages timely cached. Automatically flush product pages cache after each purchase: choose whether to flush only product pages cache or the cache of associated pages as well. The extension offers an automatic cache clearing for the pages that depends on catalog price rules and pages with special prices set for particular dates. If left unchecked, Magento session files can grow out of control and have a negative impact on your store performance. Now you can automatically delete outdated session and report files using FPC extension. Additionally, you can determine how often (in days) you need to remove old session files. You can enable debug mode to make sure the extension serves pages from cache and to see page load times. Red frames will highlight the module configuration issues and help you to find and fix problems faster if they occur. Enable debug hints and you’ll never be misled while configuring Full Page Cache. It may be necessary to clear cache on each specific page individually. With the Full Page Cache extension, you can do this either programmatically or via GET Param. To activate the option for a specific product, you may as well employ product grid update attributes mass action. In case on your website IP detection is not working properly you can enable/disable debug mode on the store page via GET parameters. This option enables you to quickly compress your data for cache storage. You can also specify the level of compression. Specify maximal database cache storage size in Megabytes to limit cache generation according to your needs. With this option you'll be able to cache your mobile and web browser pages separately. The Full Page Cache extension also supports multi currency websites. The extension works with any kind of SSL secure sites. All secure pages get cached. Whether you use Content Distribution Networks or not, the Full Page Cache extension will cache your entire page either way. Together with CDN you can get even better load speed results. The speed up Magento extension also supports Magento mobile theme, multiple stores & currency, doesn't depend on a webserver. Moreover, our Full Page Cache extension is compatible with 3-rd party extensions and themes, it can cache any page, not depending if it's a standard Magento page (like category or product page) or a page created by some extension. With the full page cache tool you can dramatically improve the speed of the Improved Layered Navigation and AJAX Scroll extensions by Amasty. The extension is fully compatible with the Landing Pages Amasty extension. Rich even higher search ranking positions and better conversion rate due to the synergistic work of these modules. Why do you need a cache crawler? Full Page Cache Crawler is an indispensable tool when it comes to 'warming the cache' for better page load performance. The pages visited by a great number of users require much more time and server resources during the first request for cache generation, while the following requests are performed faster, because the site displays cached content. Therefore, to make this process less time consuming and invisible for store visitors, the crawler is developed to crawl and request popular pages when the number of visitors is minimal. Full Page Cache crawler carefully sorts site pages choosing those that should be cached first of all and adds them to the queue. After the queue is generated, the crawler processes it using cron. The pages are generated emulating various combinations of parameters and then are cached. If your webshop has thousands of pages which are being constantly but not evenly updated, the feature will do you a great service. Googlebot has limited numbers of pages to index within a one-time interval. It may loose much of the crawl budget on the pages that were not modified since the last update. The feature allows skipping such pages and re-indexing only modified ones. Thus, significantly increasing the amount of re-indexed pages. Queue options tab includes a rich list of settings that will help you to fine tune crawling process according to your needs. See a thorough instruction here, it explaines how to configure the module in details. Just select the tab with the info you want to learn at the top right corner. 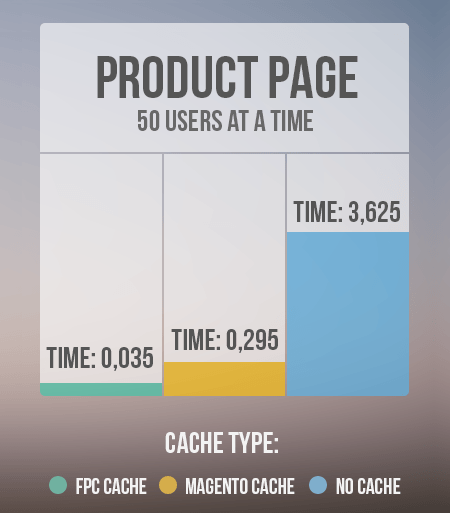 Customers frequently ask us how much faster Amasty Full Page Cache is, compared to Magento Enterprise Full Page Cache. So, to get the precise data we decided to conduct a series of tests. We ran rounds of tests for 10, 20, 30, 40, and 50 simultaneous users. 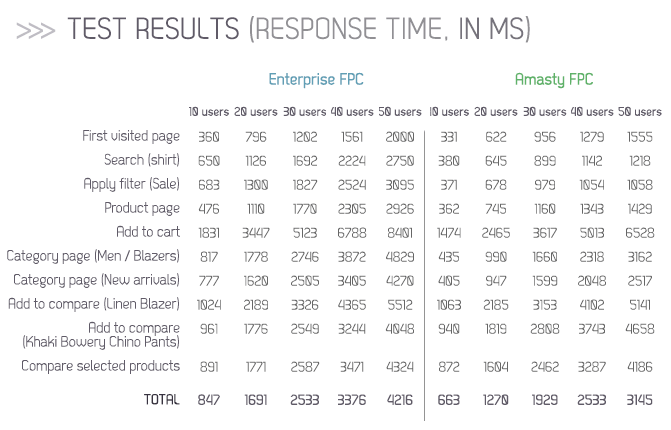 The results showed that Amasty Full Page Cache surpassed Magento Enterprise Full Page Cache in most of the actions.To demonstrate how this works for your business, here’s the table of performance improvement you can get if you replace Magento Enterprise Full Page Cache with Amasty Magento FPC. How the extension was implemented by others? Real use examples. Our customers were curious to find out how our extension stacks up against other modules on the market. So we've decided to conduct a study comparing Amasty Full Page Cache and Varnish Cache. The results were astonishing. With our Full page cache 14 tested pages load 2-4 times faster than using Varnish Cache together with a Magento integration extension Turpentine. You can see the most significant difference when a user first visits a website, which is clearly the most important moment in visitor's path to purchase. Unfortunately, the current behavior is common for websites with a high quantity of pages and visits. Please read the long answer to learn a few workarounds for the problem. For the Full Page Cache module, there are four available cache storages that will influence the overall cache performance. These are Redis, Database, Server, Memcache and each one of them has its pros and cons. Read the full answer to get more details on them. Yes, the Full Page Cache extension supports Redis. To see the full list of supported Magento caches continue reading. Yes, the Full Page Cache extension offers to apply the hole punch to blocks. See the complete answer to learn the full list. What server configuration is supported by FPC? Amasty Full Page Cache module supports any server configuration, no additional software is required. It depends on your current TTFB and server. According to the tests we conducted, our FPC extension can save seconds of loading time which may be critical for your visitors and ROI as a result. Read on to see the tests results. Can all store pages be cached at once? Yes, this can be achieved with a cache crawler which is included in FPC. You will also need your XML sitemap which contains links to all pages of your site (you will be provided with all the detailed instructions on how to use Amasty cache crawler for that). How does FPC work for multi-language websites? Each store will have separate cache warmer. This ensures that all the information shown to your visitors is correct. What is more, you can create as many combinations for Amasty cache crawler (included into FPC) as possible to ‘warm up’ them. Can I disable FPC on a particular store-view? Yes, it’s possible. You will just need to indicate the store ID in the Observer file. Yes, sure you can keep all the checkout pages uncached for correct operation of the process. Use special settings listed in the full answer to conduct caching of the needed areas. I have many customer groups. How FPC will handle that? You can set best Magento Full Page Cache plugin's cache options for each customer group to make sure all blocks, prices, etc. are displayed correctly. Can I refresh Full Page Cache when needed? FPC can be refreshed at any time via admin panel or with the help of a script. Can I refresh FPC for only some pages of my site? Yes, you can do that by creating a special file and listing in it the pages where you need to flush FPC (you will be provided with all the detailed instructions on how to do that). Does FPC work properly on HTTPs sites? Yes, Amasty Cachespeed extension fully supports HTTPs. The extension supports responsive mobile interface. All you need for this is to enable mobile design in the general settings section. Go on reading to follow detailed instructions. Can I modify when Full Page Cache should expire? 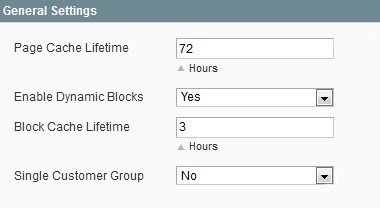 Yes, Full Page Cache settings provide an ability to change cache lifetime (in hours). A large number of pages may receive "Cache miss" status because 'curl' is used as the User Agent. Read the full answer to see the settings. The cause of the issue is "Collect Page Visit Statistics" option which is set to "No". Read the full answer to get a complete instruction on how to solve the current issue. Our experienced Magento certified support team stands ready to assist you in excluding blocks from Full Page Cache, setting up the extension and Redis on your server. Keep track of the cache warming performance with handy diagram reports. See FPC warmer log to identify issues faster and schedule the warmer queue the way you need. We considered all possible cases of usage while developing the module and guarantee it can be configured from the Admin Panel to work with any website or web server. Indeed the best caching extension on the market that works out of the box and brings the promised results. Though it was hard to configure it and exclude pages from caching, guys from the support team helped us a lot to set things right. Thanks! Don't normally write reviews but on this occasion I think it has to be done. I was a bit cautious about getting this extension as I had heard some horror stories about cache... hard to set up... doesnt really fix the underlying problems etc.. I need not have worried... this extension just works... minimal set up time / most default options were fine... within about 5 minutes my site was serving cached pages in a fraction of the time. Really great extension ... well done amasty. I bet this is one of the most effective tools for site performance we've ever installed. The only disappointment is that we purchased it 'too early' before you, guys, made a detailed instruction on how to configure it. So, we had to bother support team a lot of times to get the app polished. Anyway, our store performance has really improved according to the tests we've run and hopefully you won't stop improving the tool to feed us with more advanced options. I am using 1.9.2.2 and the Ultimo theme with a few simple extensions. I installed the Amasty FPC. I did not change any settings apart from enabling the cache, and the result is amazing. Page loads on a low-cost shared server with the Amasty FPC are as fast (if not faster) than my previous professionally setup Varnish turpentine cache on a high spec dedicated server (based on low traffic testing). Great extension. Full Page Cache - Shop läuft sehr sehr schnell! Ich habe mehrere Extensions von Amasty erworben und bin sehr zufrieden! Einrichtung war bissl kompliziert, aber Support Team von Amasty hat sehr schnell geholfen. War Porblem mit Cron-Jobs. Support ist auch sehr hilfsbereit und blitzschnell! Alle Fragen sowie Hilfe seits Amasty sehr schnell und professionell. The module is packed with lots of features, and I think that the price is reasonable for such rich functional. I liked the extension a lot, it really increased the loading speed of my website and as a result the time that customers stay on it to buy goods. I recommend this mod to every store owner. I would describe the size benefits of this tool, but it will not be possible here. I managed to keep greatly improve the performance of the store, reducing the bounce rate of odd order to improve conversion. Optimal tool for conversion, sales, improved experience to the user. I should like to describe the steps that allowed me to improve my 300% conversion rate, but the space is little and one was counting on some tools and support this company. I have tried different FPC modules. Amasty FPC is by far the best with flawless hole punch and dynamic block support. This extension is a revolution in speed and becomes a must-have as soon as you install it. Just works and has handy tools for viewing page loading times. The littel support needed was very responsive and knowledgeable. Amasty FPC makes our store fly, TTBF for cached pages is less than 100 ms. And although this module costs around $200, it's a good deal, because: 1. the product has tons of useful features like cache warmer, visual stats and debug hints. 2. you get quick and professional support from the developers. Don't hesitate. It saved my life and my website! This extension is incredible. It took our loading time down from about 45 seconds (heavy site) to about 4 seconds. It's incredible. $199 well spent! And with 30 days money back warranty we didn't hesitate to buy it and wouldn't again and neither should you! Get on it and speed up your site! We didn't deal with customer service as the plugin worked in a matter of minutes. Pure awesome. We have been using this plugin for several months now, and it’s exactly what we needed. It increases site loading speed and works very stable. FPC is very easy to use, clear and effective tool. It’s totally worth the price! It's a very specific module, and requires particular skills to be properly set. Being a non-technical person I never heard of the cache stuff. My store admins insisted on installation and showed me the speed improvements right after the module was added. I was really impressed. I think I'll buy some more modules from this merchant. This module is an excellent caching system. We tried a couple of similar modules, and they just didn’t do it. With Full Page Cache you can just see the results, even without using any specific tools to measure your site speed. Special thanks to Amasty support team. They were very helpful and friendly. Keep it up, guys! So if you are searching for some caching system to use on your store, go for this one, we love it! After reading reviews for this extension I decided to try it. I wasn't sure it would work as promised. But it did! The site speed has increased and I'm happy about it. However, we had some problems after installation, that's why I give a 4. Amasty fixed the problem, I'm not sure what caused it. This FPC mod is one of the most important extensions in my store. I haven't had any bad experience so far so I can't rate Amasty customer service. But I hope that if I face any problems with this extension, support will be as good as Amasty extensions. This was my next Amasty extension after Layered navigation. 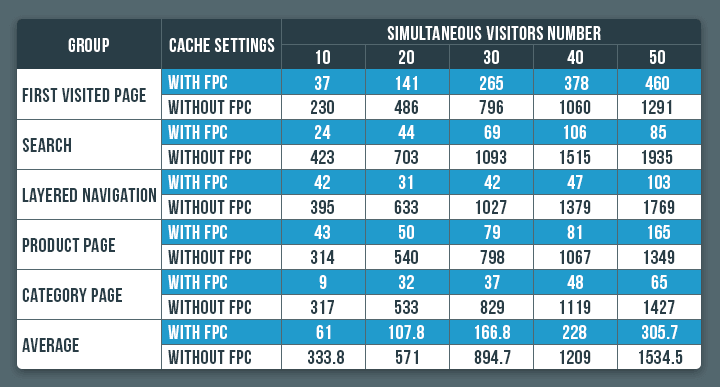 I researched a lot again and found Magento cache comparison charts on Amasty blog. I decided to try this mod although the price is quite high. But from my experience I know that Amasty doesn't have any problems with refunds. This mod works perfectly on the front-end, but my back-end isn't faster, I'm not sure whether it should be but still. All in all, thanks for creating this extension, I would never do that! But I have some issue when customize it so I ask the support. they help me to solve this problem. And Now, it works like a charm. I've recently made many things to optimize page load: I optimized images, code, etc. One of the steps was to find an FPC extension. I decided to try this one as already have a few Amasty extensions and I'm quite happy with them. The extension works great and does its job as promised. But anyway it's not a magic wand that will solve all your problems: you should still optimize your site (at least pictures) to speed it up. Why haven't you created this extension earlier? I struggled a lot with Magento speed and tried different methods with minimum or no effect. The cost of your extension is quite high but it pay off. The tool enormously improves the operating speed of your website. We were so impressed when saw the first results! It has so many configuration options that we were a bit frustrated. Amasty did a great job with the module itself and they provide very extensive support. Definitely 5 stars! I’m glad we chose this plugin from lots of similar ones. The installation went without any problems. Anyway we needed some support with configuration. And Amasty support team is amazing! I’m impressed how fast and detailed they answer to all tickets. This module really makes a difference and speeds up your site. I definitely recommend this extension for big stores! We needed a reliable extension to take care of cache management. This module works just as described, allows plenty of options and significantly improves page loading time. If you ask me what is the most useful extension for my store, answer is ready, it's full page cache which is provided by amasty. I have tested my website on google web page speed and gtmetrix results are really satisfactory. Awesome and fast support, they helped me how to configure the cron on my panel and made the best settings on the installation. I had some server load issues before i installed this plugin. After installing the plugin i had some issues with cache warmer, but after some great support from amasty and my hosting support all is working very nice. I use a lot of amasty plugins, also for all my clients, all very great! I’m a store owner with 20K products in our shop. Our shop was very slow because of this. Until we installed Full page cache by amasty. Now it works again just as fast as a webshop should be. Besides graphic diagrams are very useful - you know instantly how your server is working. For future I suggest it would be useful if the crawler were to run more often, and only recrawl pages that had changed. I've only been using this for less than 24hrs so still have not fully tested it, but so far it's working great. I've tried almost all the FPC extensions available for Magento and have always had problems with them, cart not updating, customer being able to login, having to create hole punches for some things the list is quite large, I just wanted something that worked that I didn't have to mess about punching holes in things or making complex changes to things, this is it. You can pay up to $1000 for a FPC and from what I've tried they don't work any better, and in some cases don't work as well. I would like to express my appreciation for the excellent extension and service I received from Amasty. When we redesigned our website with Magento we had never contemplated running into a huge performance issue due to the extensive size of our catalog. We tried all types of tweaks and extensions with only a slight improvement. Amasty full page cache was recommended to us and it has had a miraculous effect on the performance of our website. The website was practically flying. If you have a large catalog this extension is a must. Special thanks to Nikolay in helping to install and calibrate all the extensions on my website. First of all let me say that I am very skeptical of these "miracle" things that supposed to make thing so much better. But after some research, a lot of experts were saying that full page caching is one of the best way to speed up your magento site. II had already minimized CSS JS and done other caching plus optimized images, etc. which made the site quite fast. BUT with this extension the site just because lighting fast. It is day and night difference. I sound like a sales person but I am just a grateful client. Please do yourself the favor and buy this extension. Also, the support is awesome. I had a couple of questions and they immediately replied and helped me set tweak some small things to make it perfect. We moved from lesti fpc to this one. Much more options and good performance! This is the 3d fpc extension we use for our store. Unfortunately, previous tools didn't show good results - nearly zero speed improvement. The fpc by amasty seems to be an awesome replacement. The support managers were very patient and carefully listened to our moaning :) We are more than satisfied with the results. I love Amasty. I wish they weren't so great and busy all the time and I would give our whole site to them to help customize. The Full Page Cache extension is amazing. Our site now loads basically in 1 sec and our customers don't have to wait for pages to load up. Nikolay, who helped us install the extension, fixed all the little issues we had with the extension and now everything works perfectly. If I had known about Amasty earlier, they would be the only developer that I buy my magento extensions from. Can't wait to see what new things they come up with. Page load came from 3s to 0.02s ! This is a must-have extension for all our future projects. Thank you to the support for the explanation on the XML configuration file which allows to add specifics blocks in cache. This part may need an additionnal documentation for developers? A good one among competitors. Would be nice to see some kind of speed graph/history in the backend, so I can make sure the extension is really working for all the visitors. Anyway, a good addon. Getting under 0.2 seconds response time for catalog pages. And what a magic, it integrated with our theme just fine. We've just installed the module and already noticed positive speed up tendency. The module does what it promises and that's a pleasant surprise for us, as we've already faced hundreds of addons doing nothing except for making us waist time and money. Thank you Amasty for the quality job. – Fixed an issue with generating URL for Crawler. – Fixed the Number of options counting for each URL in Visual Stats. – Fixed an issue with multistore view queue generation logic. – Fixed issue with caching special chars.